On my 2nd and last day in Slovenia, I woke up in Ljubljana with a feeling of missed opportunity: for I had failed to capture the capital city's vibrant nightlife, which came as a surprise to me given the tranquil and traditional nature of its charming cobblestoned Old Town. Those close to me *does the Mockingjay salute to my long-suffering friends and family* know that my need to be aware of every detail of my travels borders on the obsessive (some would say I'm a control freak, I prefer the phrase 'detail-oriented'). Having found myself unprepared for the dark side of Ljubljana's moon, I drove to the most famous destination in the town of Bled praying that I had done my homework, and that Lake Bled would be as breathtaking as I had hoped it to be. 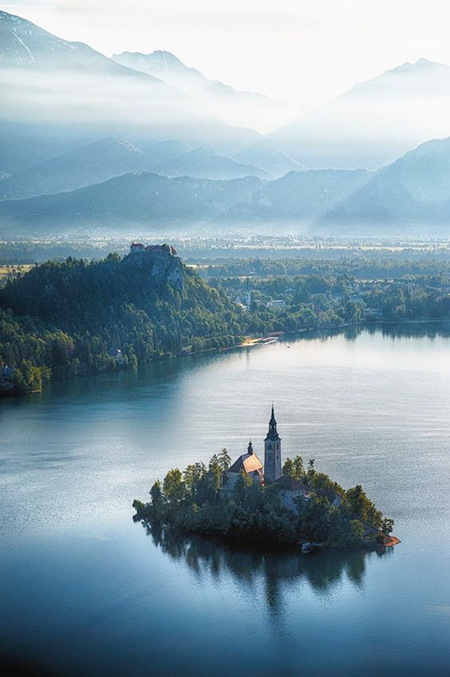 I did know that Slovenia is an almost-landlocked country (but for a sliver of coastline measuring a mere 27 miles from Austria to Croatia), which made Lake Bled all the more remarkable. Clear azure waters wrap its watery embrace around Bled Island (the country's only natural island) - a tiny sliver of rock made even more incredible by the church that topped it like an oversized candle on a birthday cake. No doubt that Lake Bled is stunning in all seasons. But on that warm summer's day the lake was especially gorgeous - the sunlight pierced the impossibly clear waters with such an intensity that the sun reflected from the bottom of the lake, forming flares of light from beneath the surface. The lake is framed on one side by the Julian Alps; whose crisp, clean Alpine waters feed Lake Bled. I spotted impossibly toned and tanned locals and visitors alike, who all flock to arguably what is Slovenia's most famous beauty spot, frolicking in the pristine waters - paddleboarding from the shore up to the church, swimming in the shallows, and hurling themselves into the cool waters from a tire swing. With rows of boats on the bank waiting to take visitors to the church on the island, the scene was complete - Lake Bled was indeed every inch the idyllic image that so many Pinterest posts had painted in my mind. As we rowed across the lake toward its island, Bled Castle - the oldest castle in Slovenia - kept a watchful eye. A detail I had failed to note before coming to Bled (Slovenia really was giving me all the bamboozles!) was that the direction your boat rows makes all the difference. The most gasp-worthy approach is to row toward the island facing the steps that lead up to the church. Of course, I had no say in this because I was sharing a larger boat with several other people and so we approached the island from the side, which didn't make for the most dramatic reveal. Even so, the concealed view of the steps didn't detract from the smooth ride and the pure relaxation of letting my hand flow through the cool waters as we glided across the lake. Having dropped the anchor and decked the boat, I began climbing up the 99 stone steps to the church. As so many pilgrims and romantics have done, I made my way to the church with a sense of wonder. The gothic church, whose current form was built toward the end of the 17th century, is decorated in two styles - with remains of Gothic frescos from around 1470 and with rich Baroque gilding. After polishing off a much-needed and incredibly refreshing watermelon and peach sorbet, I headed to the source of the ringing bells. The tale is that the 14th century wishing bell is a monument of love by a young widow who had the bell casted for the chapel in memory of her husband. Sadly, the boat transporting the bell to the island was sunk in a storm, taking with it the crew to their watery graves. It's said that to this day the bell ring from the depths of the lake. After the widow died, the Pope consecrated a new bell and had it sent it to the island. Legend has it that whoever rings this bell in honour of Virgin Mary have their wishes granted. The wishing bell and the chapel's romantic story is no doubt the reason why the Pilgrimage Church of The Assumption of Mary is a popular place for weddings. Traditionally it is considered good luck for the groom to carry his bride up the steps on the day of their wedding before ringing the bell and making a wish. Standing at the top of the steps overlooking a vista of blue and green, with the sound of the wishing bell chiming across the countryside air, an inexplicable sadness came over me. Here I was taking in one of the most beautiful sights I had ever seen, on the most perfect summer's day I could ask for, in a place with so much history, and yet all I could think of was the person who should be there to enjoy this scene with me. The tragic and romantic story of the widow, the sunken ship, and the wishing bell whose pure, clear notes struck chords in my heart with every chime- the muchness of it all welled up inside me and spilled forth a strange mix of serenity, dissonance, euphoria, and sadness. The flavour for this cocktail of emotion would be perfectly described as 'bittersweet'. ...and yet, despite it all - perhaps it was the spiritual energy of Lake Bled, Bled Island, and its church - I knew (and know) that everything will be alright in the end. The heart finds a way. Wanting to end the beautiful day on a sweet note, I set off to shore in search of an iconic treat. A delicate, paper thin golden crispy crust made from butter (not margarine - God forbid) dough sandwiches the lightest vanilla cream with an almost cloud-like consistency, topped with whipped cream and generous dusting of icing sugar. Cream cakes are in fact the symbol of Bled, with over 12 million sold in the 60 years since its inception in the Hotel Park patisserie. Cream cakes are admittedly a dime-a-dozen in Slovenia (indeed, every waterfront cafe in Bled serves them) but the only place to have them is in the town it was born in. Enjoyed with an ice-cold coffee on a sunny day, it was pure bliss. 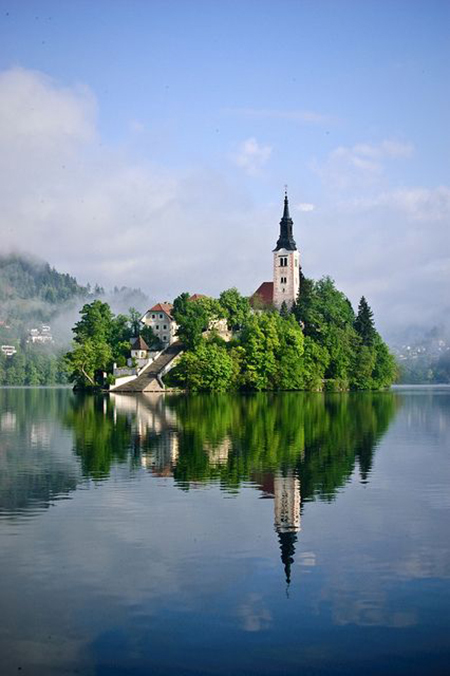 Whether from the invigorating fresh air of Bled or the peaceful vibrations of its island church, I slept well that night - rested and ready to move on to Croatia.